Prototype: Two German Federal Railroad DB 3 axle rebuild car pairs and a half baggage car. 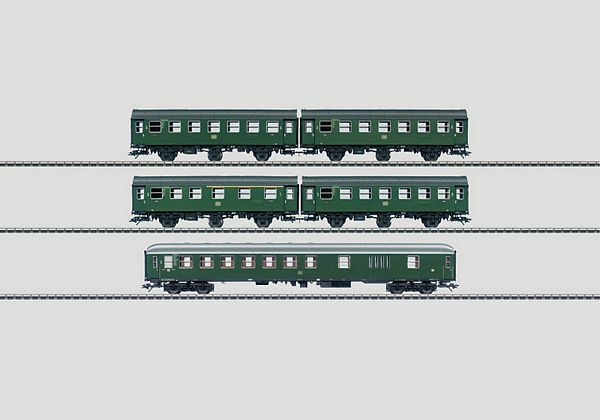 One type B3yg, 2nd class, and B3yg, 2nd class, rebuild car pair in green, one type AB3yg, 1st/2nd class, and B3yg, 2nd class, rebuild car pair, and a type BD4um, 2nd class with baggage area, half baggage car in green. Model: The rebuild car pairs and the half baggage car have factory-installed interior lighting with maintenance-free, warm white LEDs. The half baggage car also has a marker light and is equipped with a pickup shoe. The rebuild car pairs are permanently coupled together with current-conducting couplings. The car pairs and the half baggage cars have current-conducting close couplers and can be uncoupled from each other. Power is supplied via the half baggage car. Total length over the buffers 89.2 cm / 35-1/8". DC wheel set 12 x 700580 and 4 x 406240. The class 24 steam locomotive goes well with these cars and can be found in the Marklin H0 assortment under item number 36242.